Google Instant: How will it Impact Your Search Campaign? On September 8th, Google unveiled the latest and greatest in search technology. It started with a ton of hype, with the search giant sending an email to reporters and tech journalists saying it was an event they “didn’t want to miss”. Did it live up to expectations? Oh, yes it did. Google Instant aims to take some time off the average 9 seconds it takes for a searcher to query any given term. Using a technologically innovative AJAX interface, it displays query results almost instantly without having to hit “search”. The focus is on providing useful, relevant results to the user in a minimal amount of time. After entering just one or two letters, it displays a results page directly under the search box. Users are able to quickly and easily get suggestions on what to search for based on Google predictions. 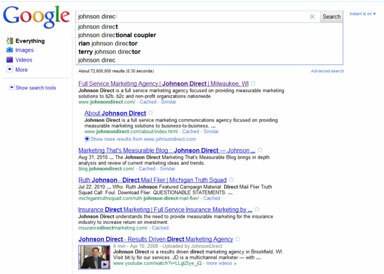 Predictions are based on popularity, and, from what we’ve seen here at Johnson Direct, personalized and local search. 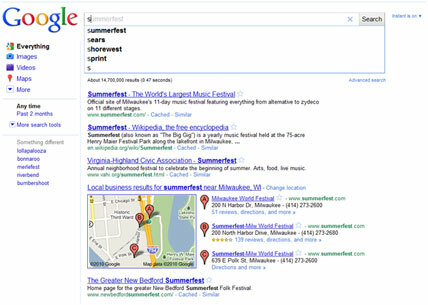 As a brief example, anyone in the Milwaukee, WI area searching for “s” will get “summerfest” as the first result, whereas anyone outside the area would most likely get “sears”. Marketing 101 would say that if you want to get in front of users then optimizing for shorter length keywords will produce far greater results than longer-term traffic with 4 or more words. Not so fast. We’ve written at length before about developing optimized web content and a new Conductor research report shows the same holds true after Instant: relevancy is still king. 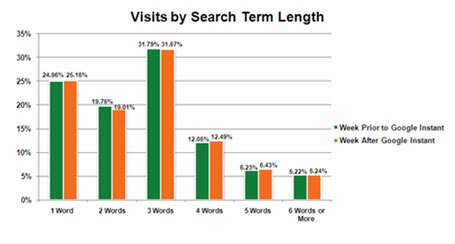 Looking at the compiled results above, we can see that not much has changed in terms of visits by keyword length. Shorter term traffic in the sample has remained constant, as has traffic with 4 or more words. Results were compiled from 10 high-traffic Conductor client websites across multiple verticals before and after Instant’s launch. While 10 high-traffic websites doesn’t say much about search results as a whole, it’s safe to say that the results do indeed have meaning. So wait, what should we change in our strategy to adapt? The short answer is: nothing. As with any change in the Google algorithm, you need to analyze how it’s affecting your website. Don’t focus on aggregate data like the info graphic above. Sure, as a whole, Google Instant may not negatively impact your search strategy but I’m sure there are some cases where websites are getting the short end of the stick (see Google May Day Update). Another component of “Google Instant” has now launched in most areas and will impact search marketing. Google users are already seeing a little magnifying glass next to search results. When the user clicks on one it reveals a thumbnail of the page and activates the same behavior as a rollover for all results. The user can then quickly rollover the icons or even just the search result to “scroll through” thumbnails of pages. This presents a new challenge to search marketing and web design on the whole. We are now presented with a new user abandonment process. A user can rollover the icon, make a determination about visiting and move on without ever clicking through. This new Google product raises the bar for establishing credibility through sparkling visual design. Studies indicate that users establish an opinion of a brand by viewing its website for only 1/20th of a second. Now they don’t even have to click through to do that – they can rollover your thumbnail and move on based on a subconscious cognition that the site or brand isn’t trustworthy. Worse yet if they are searching on a term that shows your competitors they are now only a rollover away; so if their sites look more credible you may just loose a customer to them without them even clicking through to you well-thought-out, content rich site. The second challenge is how do we track this? The jury is out on whether an old school process could measure this – placing a trackable graphic (a transparent pixel or any other graphic will do) at key parts of all landing pages. This would, in theory, provide us with a new measurement matrix. It could show us how many users loaded the thumbnail image and didn’t click through. This may not in fact work though as it appears that Google is actually displaying a cached “snapshot” of the page, not the compiled html and graphics (gulp). Lastly it’s notable that for some reason the thumbnails do not display Flash at this time. There goes that beautiful marketing header / image rotation / product wizard / user-type navigation you worked so hard on. Better at the very least get a graphic behind that thing that will show a complete image in the Google thumbnail. Would it be interactive marketing if things didn’t constantly change?